Click the image for some fun facts about fruit slice candy! …but I hadn’t thought about making them at home. But after reading many food blogs, I’ve realized that there’s nothing you can’t make at home! When I visited The French Pastry School in Chicago, there was a package of delicious jelly candy in the goody bag. It was wonderfully soft and obviously made with real fruit. I realized that if they made it at the school, I could probably make it at home. Then I remembered that Michele from Veggie Num Nums had fruit jellies on her list of goals. Since I have no goals (well, none that I’ve publicly documented), I may as well help her work on her list, right? We researched recipes and found that, first of all, the name for these candies is Pâtes de Fruit. Many of the recipes call for tartaric acid and some call for apple pectin. 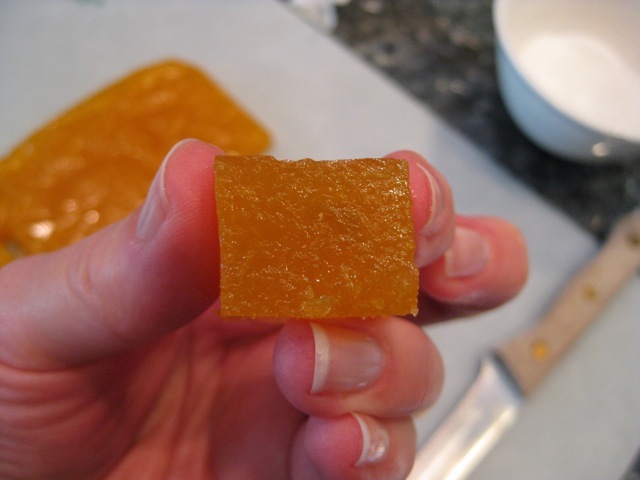 Also according to one source, the amount of pectin needed depends on the fruit you’re using. This was getting complicated and more than I wanted to get into to just make some fun fruit candy. 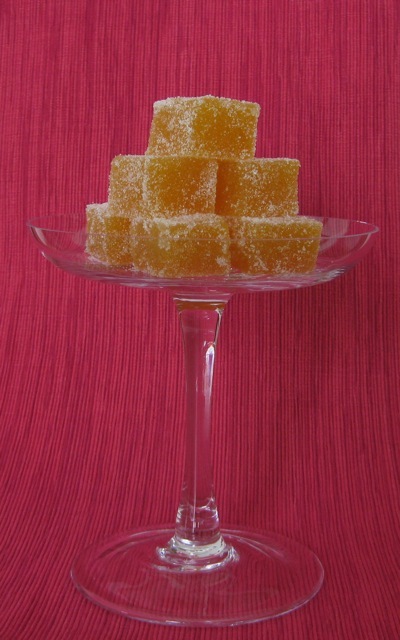 Happily, I found an easy recipe for Mango Pâtes de Fruit on the About.com Candy blog. The candy blog is written by Elizabeth from Cake… or Death?. Two more blogs for you to check out after you’re done reading my engaging post! Without further ado, here are my Mango Pâtes de Fruit. And here is an extreme close-up (with a bonus close-up of my fingernails). These were good! The fresh fruit flavor shines through. If I make them again, I’ll make them when I can share them with a group, because an 8×8 pan makes a lot of candies! They are also best when freshly coated with sugar. I needed two mangoes to get enough pulp. Instead of cooking and mashing the mango to get the pulp, I let them get very ripe, then peeled them, cut into chunks, and gave them a whirl in the food processor. The recipe says that you will need to cook the pulp and sugar for 30 minutes – 1 hour. I cooked mine for an hour, at which point it was very thick and had reduced by about half. I found liquid pectin at the grocery store. I read a little bit about pectin and it sounds like you cannot swap powdered for liquid pectin; the general rule is to go with whatever the recipe calls for. Be sure to stop by to see Michele’s strawberry version! I love those fruit candies too! Although I’m not nearly ambitious enough to make them at home. Congratulations! How impressive Jill! I’ve seen baking recipes that call for chopped, candied fruit – and always thought about making my own… but you’ve made it look easy! Mango – what a great flavor. The cubes look perfect! These look interesting and fun! Such great colors and flavors. Always something fun and new over here! Awesome. Already love Liz at Cake or Death? and About Candy! I’m pretty sure, or so it seems, that Susan of Sticky, Gooey, Creamy, Chewy made these a few months back—I think. Someone did. (In case you wanted to check those out.) Great job! I did see Susan’s post – she had lots of good info and a link to more good info! These look fabulous Jill! I think that they turned out perfectly. I love that you used fresh fruit–the flavor must be amazing. After Michele’s post I landed here to check mango pates de fruit.. amount of pectin depends on the fruit… thats a very useful tip..
Mmm, those look delish! I haven’t had jellies in forever. I seem to remember a candy that was orange jellies coated in chocolate. P.S. I enjoyed your pics to Mexico. We’ve been short on blue skies here lately. We went to Mexico for Christmas last year and we went to Coba as well. Good thing that rope was there, lol. Now this is quite an accomplishment-and a beautiful one at that! I bet these were delicious!!!! They look spectacular! BRAVO!!!!! How gorgeous are these? I have seen a few people make these lately, and my mouth is now watering for my own. Oh my gosh, they’re so pretty! I’ve never thought to make my own fruit candy. They look delicious! Impressive! I’ve had these before but just never thought of making it at home. Thanks for the inspiration! Those look so professional, very impressive. I love those fruit candies, too.